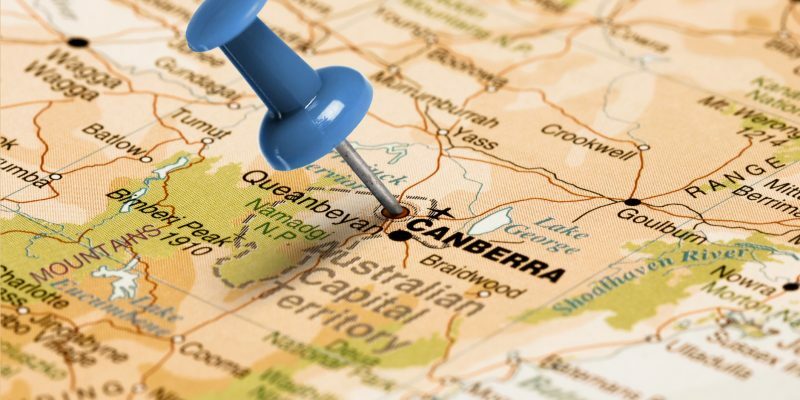 What’s happening in Canberra’s Job market 2019? As we look ahead to 2019 and beyond, we have done our research into global, national and local market trends in order to bring you a review of the current market climate and our predictions for the year ahead. – How strong will the Canberra job market be in 2019, and what are the major influences? – What we anticipate will be the market shortages employers will struggle with? Nationally, particularly NSW, states have seen the housing slump lead to worsening employment figures. This is not the case in the ACT as according to Moody’s Analytics, house values are predicted to rise by 6.1 per cent, while unit prices are forecast to grow by 3.3 per cent. Domain’s predictions are a little less ambitious, expecting more modest growth in Canberra’s property market in 2019 at 4%. According to the The Bureau of Statistics, throughout 2018 The ACT had the nation’s lowest jobless rate at 3.4 per cent. This is not unusual as a percentage of Canberra residents move here for work and often leave when that work has finished. 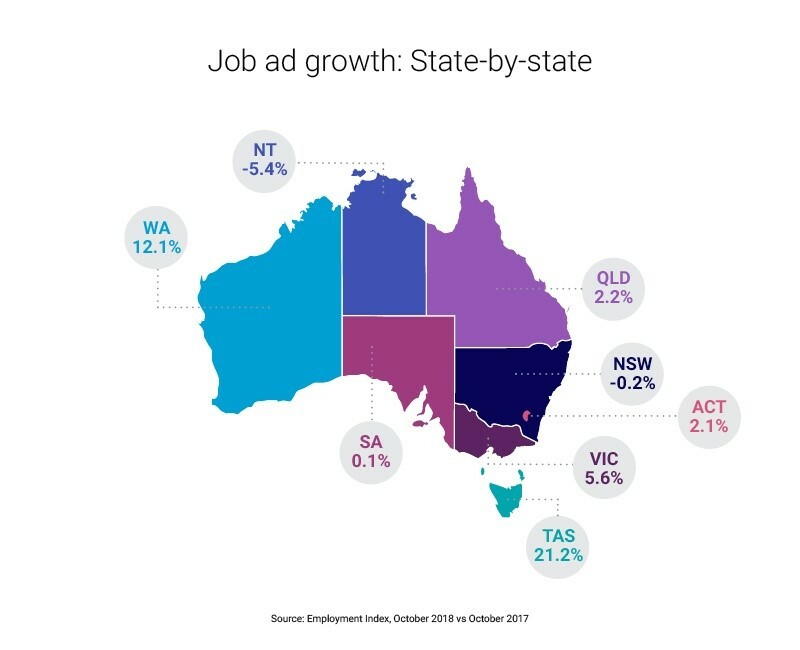 In 2018, The ACT has recorded high levels of job advertising relative to the past five years. 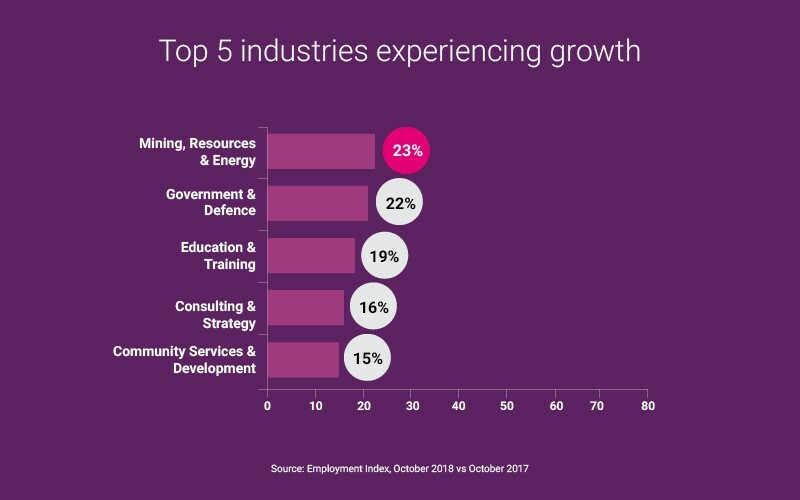 The industry that experienced the greatest year-on-year increase in job ads in the ACT was mining, resources and energy. Job ads for the industry were up by 117%, this however was coming off quite a low base. There are some industry bodies that are now based in the ACT therefore roles advertised in that sector are likely to be around policy and lobbying rather than an operational role. Leadership roles were also on the rise in the ACT, with job ads for CEO and general management up by 87%. This is likely down to overall economic confidence across the territory. Jobs received at HorizonOne in the calendar year of 2018 were up 35% on 2017which was our busiest calendar year to date. This means we have seen year on year growth for the last 4 years. Job numbers received so far in 2019 are up 25% compared with the same period last year, which was our most hectic January on record. Our Scribing and Campaigns business grew a mammoth 82% in 2018. This activity is set to grow significantly in 2019 with the predicted return of a Labor government and a likely reduction in ASL cap scrutiny. 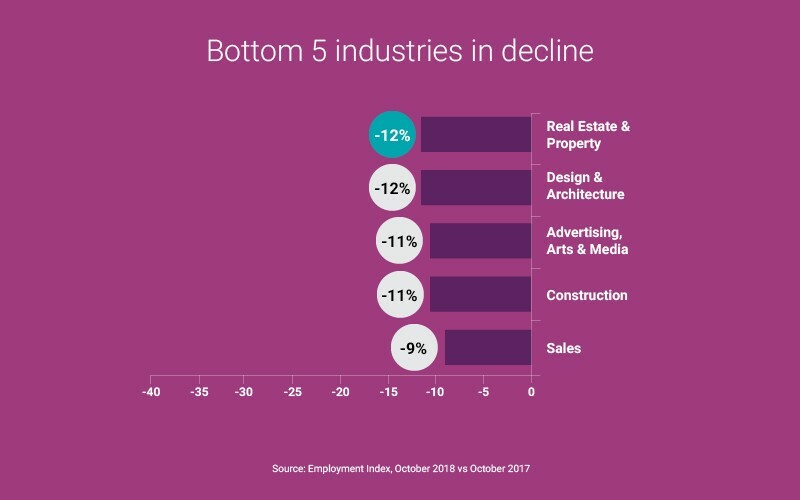 We often describe the Canberra jobs market as “the bubble” as it seems to have its own unique jobs ecosystem that operates independently of the rest of the country. Canberra’s market is always tied closely to Government hiring activity and with the way they approach partnering with the private sector. For example, it is no surprise that since the lifting of the Liberal Government’s employment freezes of 2013/14; the employment market and ACT economy has improved consistently with continued investment in private-public partnerships. However, with the anticipated return of a Labor government, what can we expect for the local economy and jobs market? Coming off the back of a market that experienced slowing growth but still high levels of activity in 2018; we will start seeing the “end of the peak” in 2019 with a drop in job market activity towards the back end of this year. 2019 will start with a bang however will slow rapidly by the middle of the year. A mid-May election will mean the traditional end of financial year “book-end” for government spending and hiring activity will likely be brought forward. The market will run at peak from early February right up to the caretaker period. Already new job numbers are surging in January compared to previous years. A slump in the market is expected for up to 8 weeks after the caretaker period is announced. A reduction over the first two years in the use of hourly rate contractors in Government by up to 40-50%, with a subsequent increase in the use of non-ongoing contractors instead. A significant reduction in the extensive use of “consultant-contractors” hired through consulting firms to support skill gaps. We will also see a steady exodus from consulting firms through 2019-20 as former public servants return to the APS with the promise of stronger career prospects under a Labor government. A relaxing of ASL caps and a swing back to the preference of permanent (ongoing) hiring in the APS. Potential swapping of functions between, or even a merger of key parts of the Department of Industry and the Department of Jobs. A continued rationalisation of corporate functions through investment in shared services. Increased funding in the portfolios of Education, Health and Environment, particularly for renewable energies. In February 2018 we predicted a steady, consistent growth year rather than the fast growth year of 2017, with potentially slowing of market growth by the end of 2018. Observations from the end of 2018 prove our prediction was…… SPOT ON! Sustained recruitment activity across most sectors in our region for the last 4 years means that talent shortages are rife in critical markets such as Technology, Accounting and Finance, and specialist Government roles. Security cleared Executive Assistants and Executive Officers (secretariat). A recurrent candidate short market, good EA’s are harder than ever to find. Procurement specialists – all levels. Clients are focusing on proactive, can-do attitude professionals and avoiding those that “police” procurement, experts in saying “no”. APS to EL1 level Data Analysts ($110 – $130K + Super) – Government is playing catch up on the data boom and we expect market shortages in this space to continue increasing over coming years. 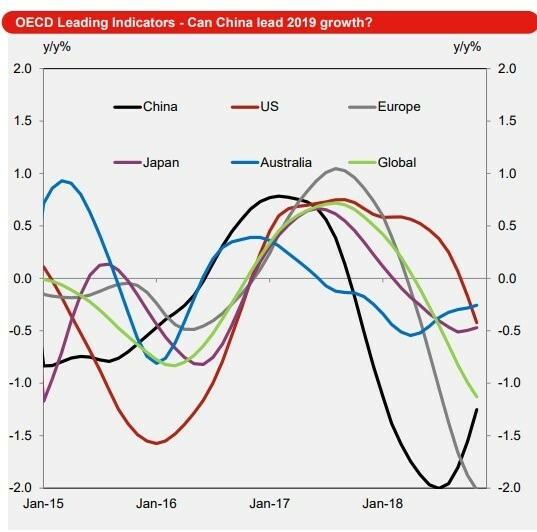 Westpac’s leading economic indicator predicts the positive momentum the global economy enjoyed over the past couple year’s looks set to come to an end in 2019. Overall the global economy looks a bit fragile with Europe and the US trending down. However, China appears to be on the way up which might stimulate a “steadier state” in other economies. Overall, the consensus seems to indicate that Australia will experience a year of constrained growth, more of a market correction than a free fall set off by a drop in the housing market. For further a reading this excellent article from Dr Shane Oliver from AMP Capital is a good summary. Nationally, there is a flattening out and in some states a decline in housing prices and construction activity. The Sydney market expects a drop of 3.3% in house values in 2019 for example. This “housing slump” has led to many economists predicting a drop in the RBA cash rate by the end of 2019, and some even predicting a minor recession! The Department of Jobs and Small Business’ Monthly Leading Indicator of Employment (the Indicator) has fallen for the ninth consecutive month in December 2018. Compared with the same time last February where they were continuous. However, unemployment figures are often the best indicator of economic performance. Unemployment is down from 5.5% in January 2018 to 5.1% in 2019 (Labour market information portal, Department of Jobs), and was as low as 5% in October. The latest Illion Business Expectations survey shows a further moderation in economic conditions at the end of 2018, and indicates a potentially disconcerting start to 2019. The decline in the expectations index fits with recent economic news, which shows weaker economic growth, a sharp downturn in housing and weaker global conditions. Despite the fact that Australian small and medium businesses continue to express confidence, the September Quarter 2018 Sensis Business Index showcased a seven-point fall from the nine-year high seen in the June report (+49). Across the nation, 60% of small businesses (SMBs) feel confident, with the main factors driving this positivity being healthy and growing sales, having a solid, established business as well as identifying specific business strengths. Tasmania overtook the Australian Capital Territory (ACT) when it came to being the most confident state or territory, up two points to +59. ACT lost its top spot by falling five points to +56, followed closely by New South Wales, falling seven points to +49. Record job advertising levels on SEEK continue to be at record highs (30% more than 2010), however, job advertising growth is increasing at a much slower rate. New job ads grew nationally by 2.8% in October compared to the same time the previous year when 12% growth was recorded. National job ad growth is predicted to continue to flatten. Mining, Resources & Energy continues to lead the way, with the industry experiencing 23% growth compared to the same time last year. This result makes it the 15th consecutive month the sector has recorded the highest job ad growth in Australia. Nationally, Tasmania led the way in year-on-year job ad growth recording 21.2% growth in October. Western Australia experienced positive results across the board, recording 12.1% year-on-year growth. When will the APS recruitment freeze end? !